Jeep has always been a trusted name in the eyes of those who seek adventure. Be to those who want to go off-road and do a little mountain climbing, or just get a little fresh air, a Jeep vehicle can do it all. So when Jeep came out with the Renegade, it turned some heads. The Jeep Renegade wasn’t the kind of vehicle customers expected from the Jeep brand, it’s not known for compact crossovers. Yet, the Renegade has everything Jeep enthusiasts want. Off-road capabilities, Jeep style, Jeep… attitude? Well, maybe not that last one, as the Renegade is a blend of the rugged and the elegant. In 2016, the Renegade had a debut that was well received, so take a look at what got so many people talking. When it comes to the Jeep Renegade, drivers only need to pick between two engines. For many of the trims, a 1.4-liter I4 MultiAir Turbo Engine comes standard. Drivers can expect 160-horsepower from this engine, and with Jeep’s signature MultiAir technology, it runs smooth. MultiAir, like other brands, is just Jeep’s own VVT design to optimize performance and fuel efficiency. A larger, more powerful engine, the 2.4-liter MultiAir is standard on the Trailhawk and Limited trims, but is also available to all other trims, so drivers have a choice regardless of which trim they choose. This engine puts out 180-horsepower and 175 lb-ft of torque. The standard transmission on the lower half of Jeep Renegade trims is a 6-speed manual, but a 9-speed automatic is available, standard for the Dawn of Justice Edition, Trailhawk, and Limited trims. The 1.4-liter engine has a fuel economy of 24 MPG in the city and 31 MPG on the highway. That number changes when equipped with the 2.4-liter engine, an EPA of 21/29 MPG city/highway. The Renegade is said to have “Best-in-class” 4×4 capabilities, the Jeep Renegade with two 4×4 systems available. Both systems feature a rear axle disconnect system that seamlessly switches between two and four-wheel drive depending on driving conditions and efficiency where 4×4 isn’t needed. The two systems are Jeep Active Drive, available on Sport, Latitude, and Limited trims; and then there’s Jeep Active Drive Low, exclusive to the Trailhawk. Style is in the Jeep name, but the Renegade has received some new features that make it stand out from the rest. It still keeps signature icons such as the seven-slot grille and strong stance, but the signature “X” accents are pretty neat. They’re inspired by military equipment to exude strength and pay homage to Jeep’s roots. Plus, the ability to personalize one’s Jeep is part of the process. The Jeep Renegade is available in nine exterior colors, and drivers can purchase decals and accessories for their next adventure. Of course, tough isn’t the only trait the Jeep Renegade is known for, elegance is in there, too. The Jeep Renegade is available with the My Sky open-air dual-panel roof found on select Renegade trims, as well as roof rails for cargo storage. The final touch? Two unique badges: the “Trailhawk” and the “4×4”. Able to sit up to five passengers, everyone has a nice seat whether the seating is trimmed in premium cloth or leather. If extra space is needed for cargo, select trims come with various configurations. A 60/40 split second row is standard in all trims but the Limited; a 40/20/40 comes standard in the Dawn of Justice Edition and Limited trims. The inside also has some nice features, such as Selec-Terrain traction control, and steering wheel mounted audio controls, and a leather-wrapped steering wheel, standard in all but the most basic trim, the Sport. A personalized instrument cluster, however is available in all trims, be it on a 3.5-inch or 7.0-inch display. Depending on the trim, drivers will either be able to enjoy a 4-speaker or 6-speaker system, sometimes with the basic radio setup and other times with a 5.0-inch touchscreen. Many trims come with integrated voice command with Bluetooth, and they all come with a media hub for USB and auxiliary input. Uconnect is an option for the Sport, but comes standard with optional upgrades for the other trims. As most vehicles on the road today, the Jeep Renegade series comes complete with an advanced multistage front airbag system and supplemental side airbags in the front and rear. When going off-road, drivers will be glad the Renegade has electronic roll mitigation and stability control. All trims come with LATCH ready child seat anchors and panic brake assist. For a little help when backing up, a ParkView Rear Back-up Camera comes standard on all trims but the Sport. 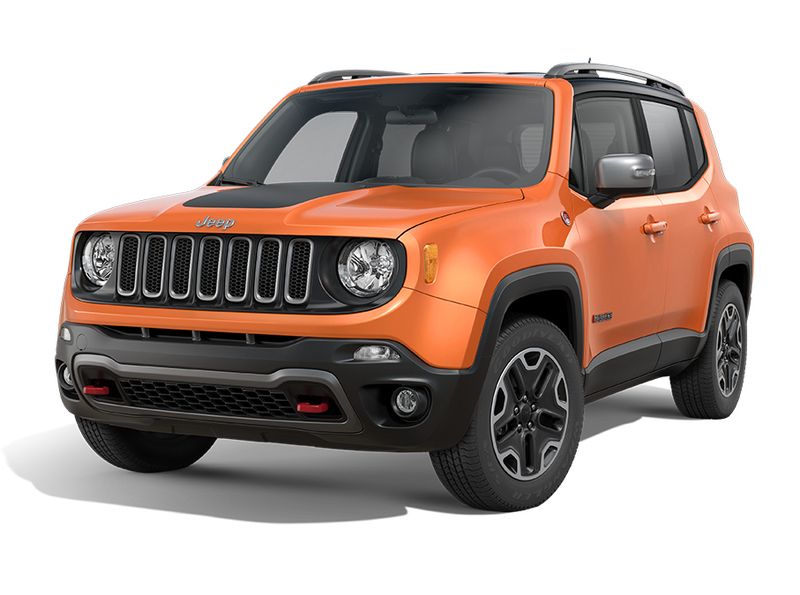 The Jeep Renegade comes with a basic 3-year/36,000 mile warranty, a 5-year/60,000 mile powertrain warranty, roadside assistance for 5 years or 100,000 miles, and rust-through coverage for 5 years or 100,000 miles.